When I started painting this morning, I did not like the result. Often when I paint, I feel happy and uplifted because the painting rolled out of me seemingly without any effort. But some days I look at my painting and just don’t feel satisfied with it. Moreover, I still feel the forcedness and restraint that I felt while I made the painting. And if I don’t feel in a flow while painting, it usually shows in the result. There are (at least) two ways to react on this. Firstly, you can focus on the product you made. Secondly, you can focus on the process you went through while making it. (If you want to read more about my personal experience with this, you can read this blog post). 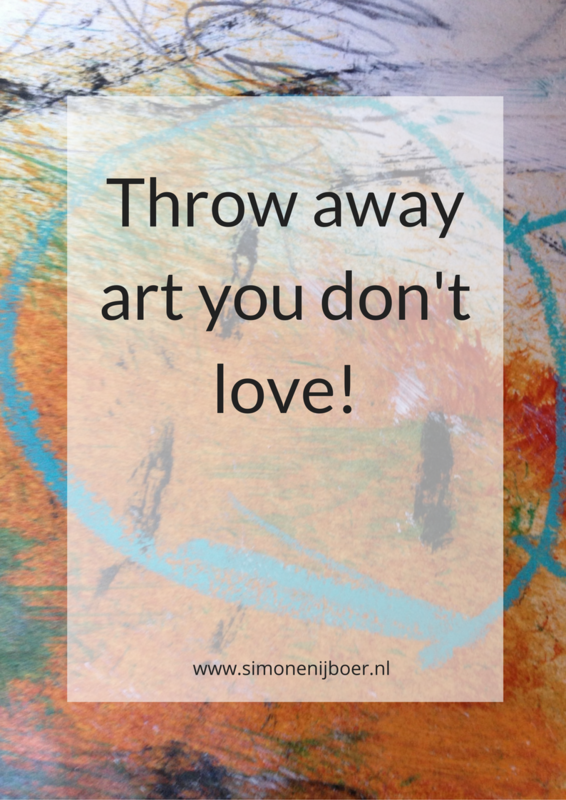 You might throw away the painting as soon as possible, and try to forget it. You push away your feelings of disappointment and go on with your life. The next time you paint you are a bit afraid because you might make another painting that you don’t like. And maybe it even makes you avoid painting altogether. When you focus on the process of painting, you might still not like the painting. 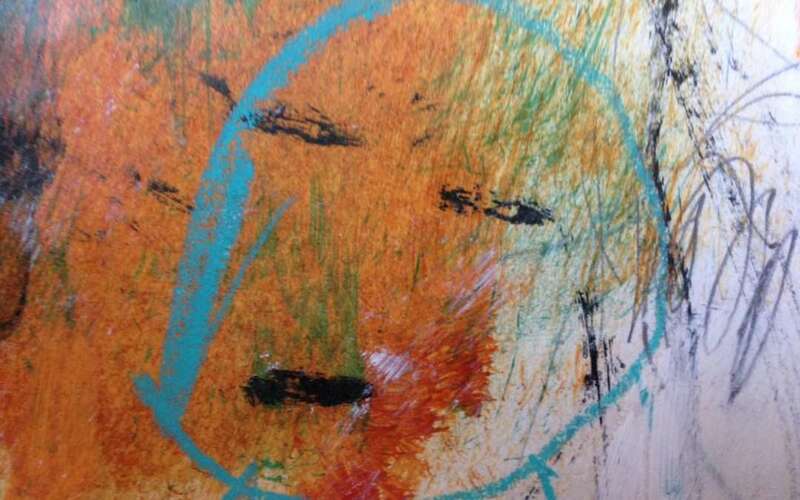 But instead of getting frustrated by this fact and pushing your painting away, you take a closer look at it. What is it exactly what you did not like? Are there any technical problems you did encounter? At what moment did you get stuck, and why? 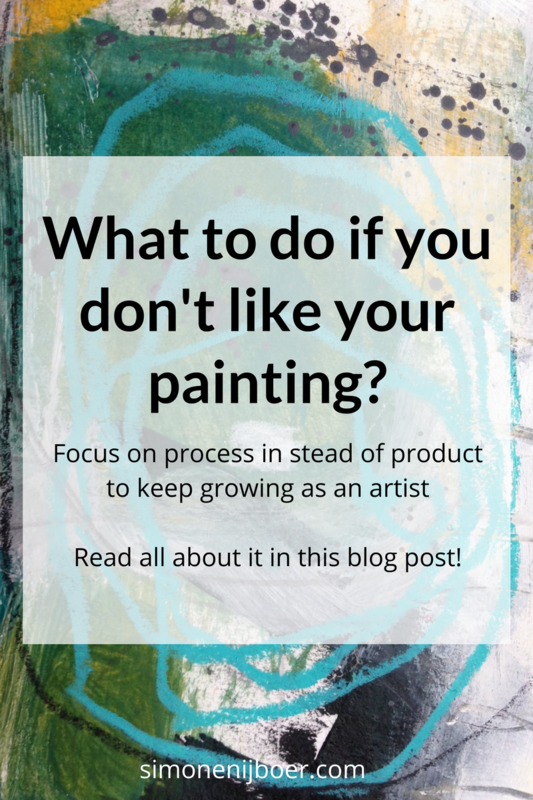 If you ask yourself these questions, you can learn a lot about your art-making and yourself as a painter. 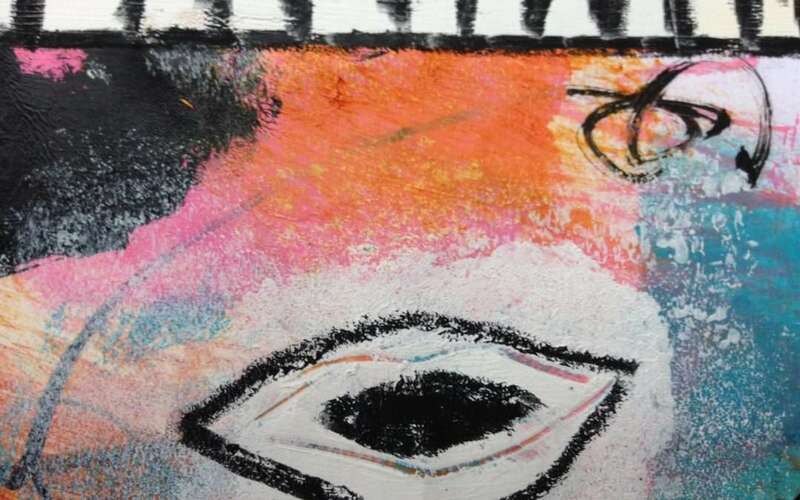 And if you go even deeper, you can look the feelings of inhibition and forcedness that you experienced while making your painting straight into the eye. Those feelings are a fundamental part of your human experience, and denying or avoiding them gives them more power over your life. If you accept them and allow yourself to feel them in your bones while painting, they can transform into a fierce energy that makes your art come alive. The result is that your paintings become more powerful. This might seem a beautiful but theoretical statement, not attainable for us, ordinary people. But that is not true. The first time you make another ‘ugly’ painting, you can honor it as a tangible proof that you committed yourself to this wonderful process of art-making and that you stuck to it. You can give the painting a place of honor, and breath in the feeling that it gives you. This way you slowly but surely integrate the parts of yourself that you don’t like. So, if you make an ugly painting shortly, rejoice! This is a beautiful chance to permit yourself for being an imperfect, struggling, inhibited and limited human being. Doing so, you give yourself permission to live life to the fullest, and make your best art along the way. PS: What do you do when you don’t like your painting? Leave your comment below, or join the discussion in the ArtNow Community! When I started painting, I was—more or less—on my own. It was the drive deep down inside me that got me painting, but there were not many people around to support me on my abstract art journey. Very few people even knew that I was painting. I did not shout it from the rooftops; I felt too shy. (Read about how I started painting here). I was very lucky that I met my art-friend Dotty Seiter at an online art-event, organized by Leslie Saeta (30-paintings-in-30-days). If you scroll back through my Daily Painting blog, you can see that it is mostly her and me communicating about our daily art practices. Right now, I know that if I had not her support, I would not be painting anymore. Or at least I would not have such a sustained daily art practice as I have right now. This website would not exist either. It was the power of community that helped me push through, and I am very grateful for that. When I launched this website, I asked new subscribers, ‘What would you need most for your art practice to thrive?’ The main answer I got was, ‘Community.’ Apparently, artists need other artists to relate to, to keep them going, to show their work, to receive feedback, and to help them overcome obstacles. And they love to give the same support in return. If you love playing football or choir singing, it is not that difficult to find a tribe to relate to. These are activities that have the community factor built in. Making art, by contrast, is something that you mostly do on your own, in your studio, or at your kitchen table. Of course, joining an art class is terrific, but art classes cost money, which you might not have. They also require time, which you might not have either. 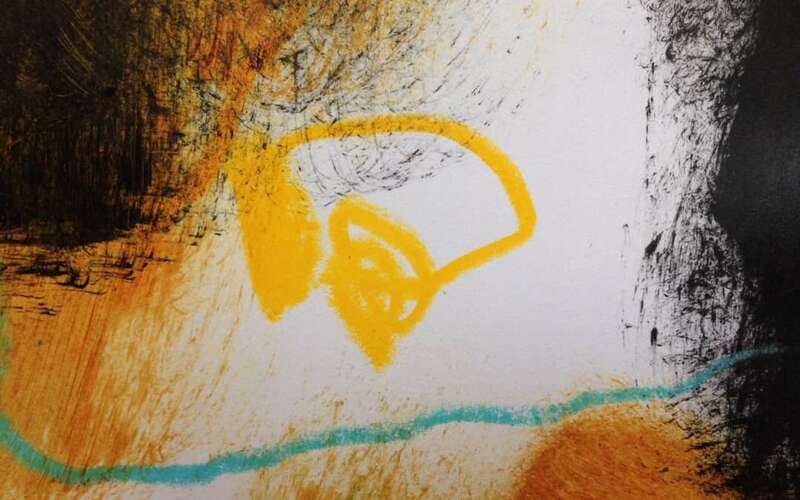 If you want to make abstract art, it might be even more difficult to find art buddies. It is usually easier to find artists in your neighborhood that love to paint realistically, painting landscapes or figures for instance. There’s nothing wrong with that, of course but if your soul yearns for making abstract art, you can find yourself on your own. Having abstract-art buddies can then make all the difference. They are on the same path, they know what it is to search your way, and they can support you on your journey. Of course, I don’t want to be negative about art-making. It is one of the most enjoyable and satisfactory activities I have in my life. But it can be very challenging, too. 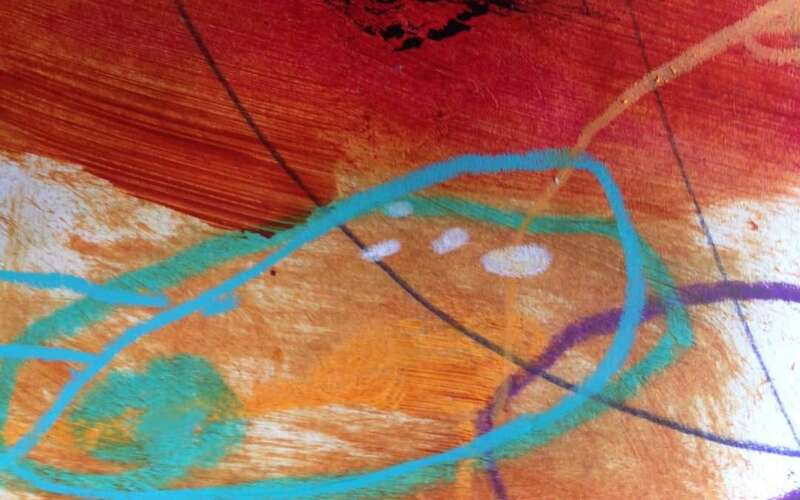 If you make personal abstract art, it comes from deep within you. You can’t hold on to any examples; you have to find your own way. That is of course not wholly true. There are many inspiring artists out there, and I have learned incredibly much from them, even only by watching their work. But there comes a moment when you have to stop looking at other people’s art, and go deep inside to find your own artistic expression. At that moment it is wonderful to have people around you who go through the same experience. Today I don’t have time for painting—I’ll do it tomorrow. I don’t have the right materials right now—I will need to buy quality paint before I start. I first need to do a course to go to the next level. Deep down we know this is not true, but it’s not always easy to find the power inside to carry through, pick up your brushes, and start making some marks. There the art buddies come in. Because they paint, you get inspired to start painting, too. Because they want to see your work, you start showing it. Because they make their beautiful things, you get ideas to create yours. Because they sometimes make ‘ugly’ paintings, you are less afraid to create ‘imperfect’ art. The opposite is also true. If you paint, and you realize that it helps other people to continue their art practice, you get even more motivated to keep painting. One hand washes the other. When I started this website, I already had plans to launch an art community where (abstract) painters could meet and inspire each other, but I did not know how I could realize it. When I learned from my research that so many artists share the same desire for community, I started browsing the Internet again, and I discovered online software that makes it possible to create a community quite easily. So I did. The result is the ‘ArtNow Community. I hope that it will become an open-hearted and supportive online community where we as abstract artists can feel at home and show our processes and products. A warm space where we can share successes and struggles on our art path. The ArtNow Community is deliberately international. The main language will be English, but I hope that artists for whom English is not their first language will not hesitate to join. We as artists are lucky that our art is doing the most essential part of the communication for us. 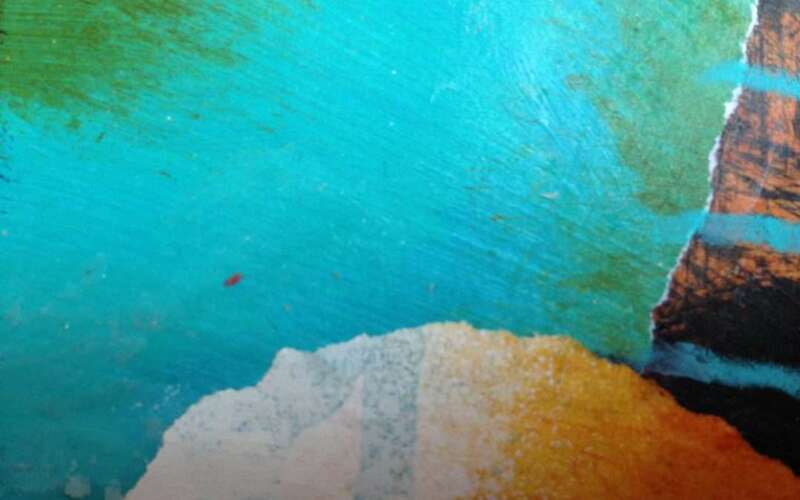 If you are an abstract artist, please join in! Everybody is welcome—beginning as well as advanced artists. And, of course, people who would love to start making art, but are hesitant to do so are most welcome, too! Read more about the ArtNow Community here. 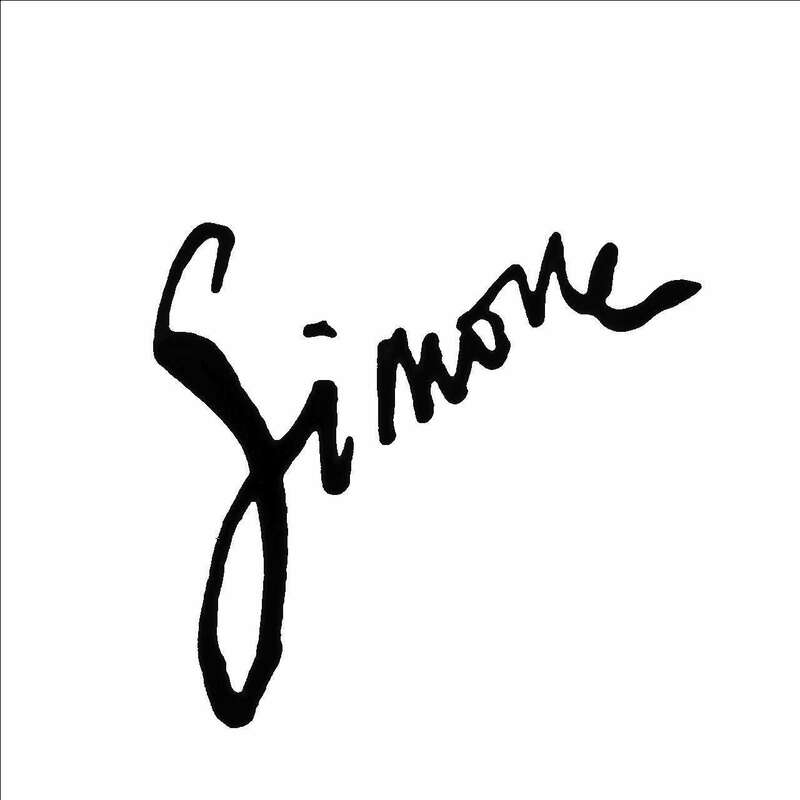 You can join by subscribing to my newsletter. Once you have subscribed, you will receive the invitation link. If you already have subscribed, please go to the download page of my free library where you will find the same link. If you have questions, remarks, or comments, please let me know below! When I started making abstract art a few years ago, I noticed a profound effect on my level of happiness and well-being. I always joked to my friends that making art was ‘the cheapest therapy ever’—but honestly, I meant it. I am not talking about ‘art therapy,’ with a therapist by your side who gives you assignments and who helps you to find meaning in your work. No, the simple act of putting paint on the paper or scratching marks on canvas gives a basic kind of joy. In this ‘cheapest therapy ever’ you don’t talk about your problems, your fears, and your pain, you don’t work through them on a psychological level, but, miraculously, painting is healing. It gives quality to your life. 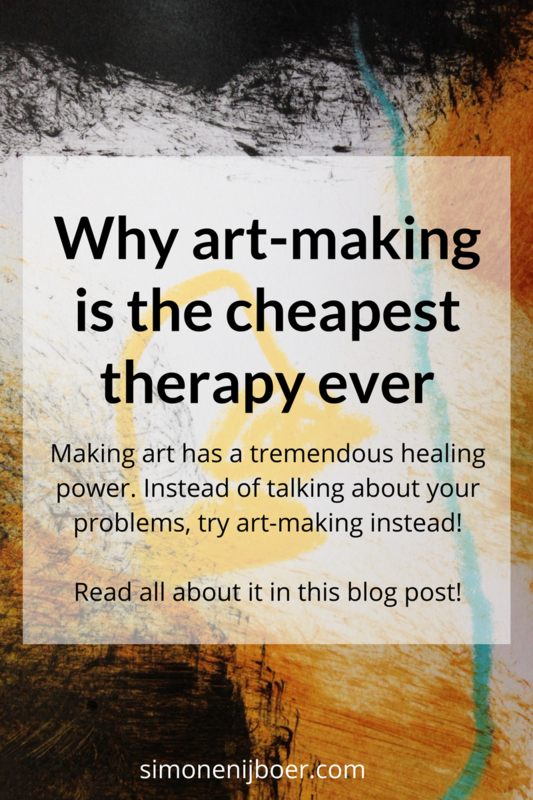 In this post, I will explore four reasons why this is true, at least for me, and I hear from other artists that it is true for them also. It might be true for you, too. First of all, making art gets you out of your head and into your body. When you first start painting it is not always so easy. You might stare at the white paper or canvas and think, think, think. What should I do? Where to start? What color to use? What mark to make? You can feel insecure, and maybe your mind starts racing around and around. When you keep painting, though, your mind slows down. 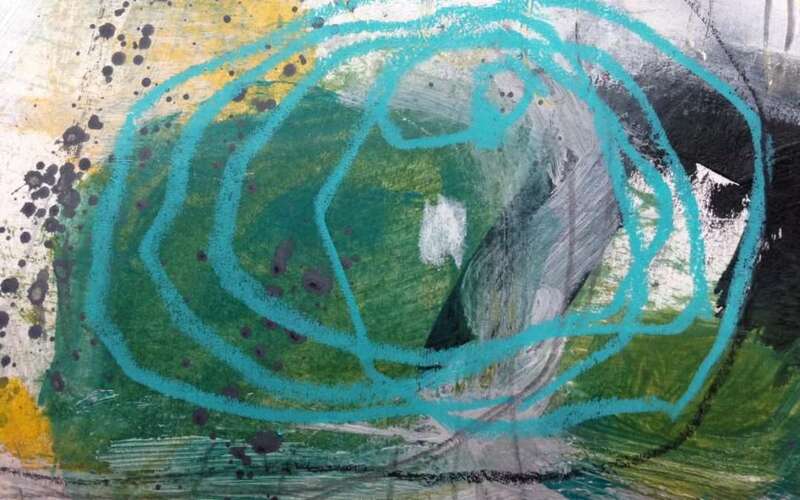 Especially in abstract art, as opposed to realistic art, there is not so much to think about. Reasonable or logical abstract art-making may not even exist. Of course, there is color theory, and there are theories about composition and so on, but my experience is that relying on that kind of art theory does not make practicing art more enjoyable, nor your art better. Personally, I like art the best that comes straight from the heart and the gut, so to speak, and not so much from the head. And more important: the painting experience is so much more fun this way! Second, art-making makes you use your bodily senses instead of your thinking. You dive into the feeling of paint on your hand, the scratching of your ink pen on the paper, the smoothness of crayon on canvas, the bright and inviting colors on your palette. You experience the world directly instead of from the head. Of course, thinking plays its role in painting. At a certain moment you get to know your materials, and you know how to mix colors and how to reach an effect that you like. You learn how certain compositions make you happy, and what you have to do to make them happen. It can be beneficial to learn something about techniques, but the thinking head plays a very natural and helpful role in this—and not the criticizing and even degrading role it can play so often. Third, art-making gives you the opportunity to explore the inner domain of intuitions and impulses and to express them without the interference of your ever-talking head. This is a miraculous thing. In our society we have to explain ourselves all the time; we have to have good reasons for everything we do. When we make abstract art, there are no unspoken rules. You are free to express yourself as you like. This leads to a feeling of freedom and endless possibilities. Of course, this does not always come easily. I get thrown out of this sense of freedom all the time, back into the struggling and the thinking. However, the more I paint, the more natural it becomes to find my way back to this free way of painting and being. Fourth, when you are more in your body and less in the criticizing head, you develop strength and resilience, and a profound sense of self-trust and rootedness in life. Art-making can be frightening—it is easy to get caught up in self-doubt or self-criticizing—but if you keep painting, you get to the other side of this fear. You learn to stay with the uncomfortable feeling of not knowing how to take the next step. When you ‘ruin’ your painting, you learn to just put another layer on it. Sometimes this works out, and sometimes it doesn’t. Both are equally fine. Tomorrow you have another chance. Nothing can ever go wrong. it teaches you to stay with uncomfortable feelings, and this helps to develop self-trust. Let me know below in the comments if you recognize this! DOWNLOAD THIS BLOG POST AS PDF! If you have the creative itch, and you would love to start creating, many things may hold you back. You may feel that you don’t have enough of the right materials, enough time, or enough space. But the opposite can also be true. You may feel stifled because you have too many materials, too much time on your hands, or too much space. I know very well from my own art practice the frustration of not having enough time, space, and materials. But I have also experienced that painting within those limits can work out very well. If you limit yourself regarding materials, time, and space, doing so can free you up and unlock your creativity. Once that has happened, you just enjoy the materials, the time, the energy, and the space that you have at that moment. You realize that you can create with every material, always, and everywhere. There is a lot to say about this. Let’s dive in! Maybe you feel you don’t have enough materials. Or perhaps you have only cheap stuff that does not fulfill your needs. Art supplies are usually not cheap, especially not professional quality materials. If you go to the art supplies store, and you fill your basket with paint, brushes, canvas, or paper, you can be shocked because of the price. In my experience, it is easy to get discouraged by this. 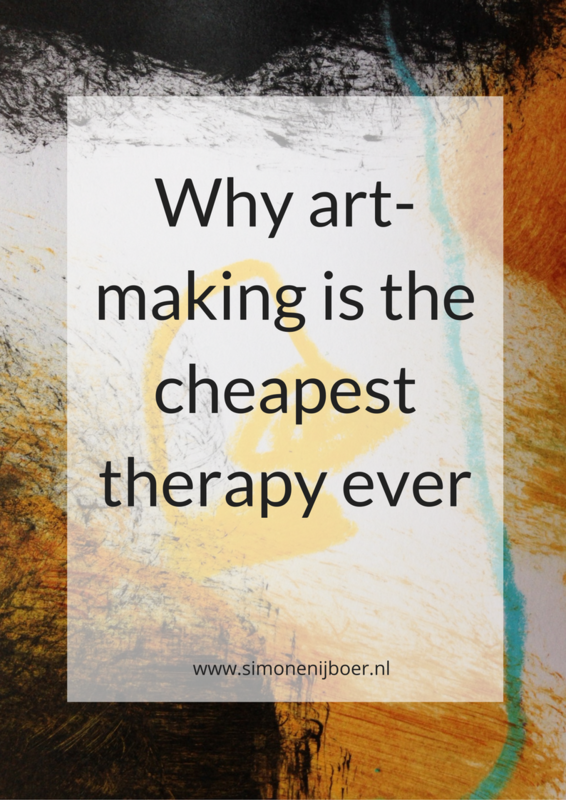 If paint and paper are that expensive, can you afford art-making? And maybe you feel you don’t have enough time. If you have a busy job, children to take care of, or older parents who need your attention, it can be difficult to find time to create. If you come home late in the afternoon, maybe all you want to do is sit down. Getting out all of your art supplies is time-consuming, not to speak of cleaning up afterward. Maybe you have a chronic illness, which drains you of your energy. You need the time to do the most necessary activities like cooking and cleaning and, after that, your energy is gone. The idea of cramming another thing into your day can paralyze you and hold you back from jumping into the creative process. Maybe you think you don’t have enough space. You live in a small apartment and have no spare room for an easel or other art supplies. You would love to work on canvas, but you just have no space to put an easel somewhere or store the paintings when they are finished. You might think you should wait until you can afford an atelier, or move to a bigger house. Maybe you are in an opposite position. You have plenty of time, space, and materials. But when that is the case, you can also get creatively blocked. If you have high-quality art materials, you can get intimidated by them. If you start making art with expensive paint, you might feel you have to make something beautiful with it; otherwise, you waste your money, don’t you? When you have many colors to choose from, which ones will you take first? Too many choices can block your creativity and the feeling of freedom. Some people can get paralyzed because they have very much time. If you have all day, why should you start now? You might start postponing. First, you will do the dishes and then go shopping. After that, you will paint. But something unexpected comes in between, and before you realize it your day is over. Maybe tomorrow. But the more you procrastinate, the more you lose confidence in yourself. You told yourself that you want to start painting, but now you don’t do it, even if the time is yours! 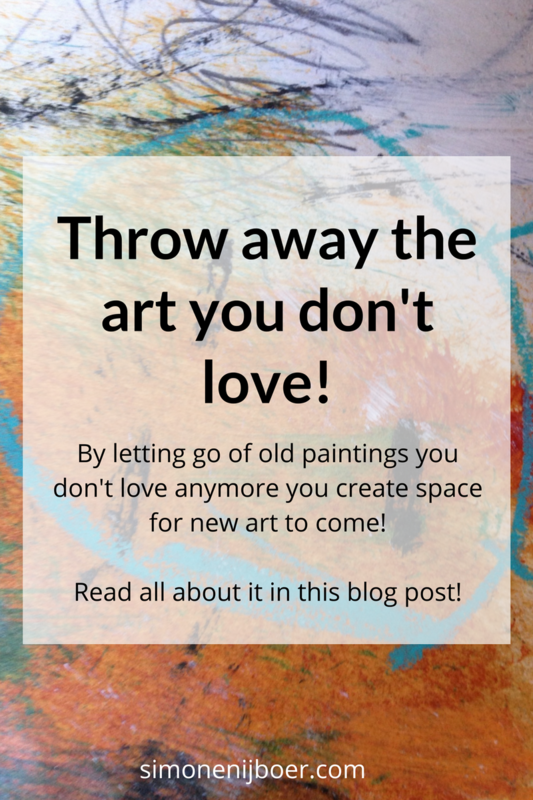 Even having a huge and beautiful space to make art can put a lot of pressure on you. If you have so much space that other artists don’t have, you tell yourself you should really make some good work; otherwise, you are not worth this space. Or you start working on a big surface because you have space to do so, but once you begin with a big painting it feels daunting. Working big is not as much fun as you hoped it would be. The big canvas becomes threatening instead of inviting and inspiring. The fact that you have limited money to buy materials, have little time, or have a small space, does not mean you can’t start making art. The opposite can also be true: if you do not have a lot of resources, it can free you up. You don’t have to wait for the future when you are actually always well-equipped for art-making. Now, at this very moment, you can start. You can pick up a piece of copy paper and just start scribbling around. You can start making a simple Zentangle (see my article about this here). You can work on the kitchen table. There are possibilities everywhere; even in three minutes you can start and finish a small creative project. When you are very busy because you have small children, you can paint along with them, on the kitchen table. And if you have a baby, you can make something minimal when your child is asleep. I don’t want to romanticize this; when my kids were babies, I was exhausted all the time, and the only thing that I wanted to do when they were asleep was get asleep myself. But you get the point: if you get accustomed to the idea that you don’t need a lot of time to create something, then you will start to notice small moments of opportunity. Half an hour just before your job starts. Thirty minutes after you have put your children in bed. Five minutes before bedtime. And when your children are older, you can create alongside them. When my daughter went to high school, she was very busy, and I started to sit down with her in between her homework moments and simply made drawings alongside her. I did not create very artistic work, but I was creating, and just happy doodling along. And at the same time I had a beautiful moment with my busy daughter. You can also look at your daily habits with a fresh eye. Do you need to watch the news another time? Is it essential to check your Facebook now? I don’t want to sound patronizing (even though I may), but we lose a lot of time throughout the day. We consume so much what others create for us, that we have no space left for creating things ourselves. Giving yourself limits can help to avoid or break through a creative block. You can do this in different ways. Having lots of art materials around is wonderful. Many colors and many tools give you lots of possibilities for expression. However, if you feel stuck, it can sometimes help you to take only a few colors or a few tools. It challenges you to use each material to the maximum of its possibilities. It makes you get to know your equipment and tools well. It also it makes you more creative. If you don’t have a lot of colors, you have to find other ways to make the painting interesting and alive. You have to dig deeper to create contrast and different kinds of details. And if you keep doing this you become more and more creative and resourceful. Another way of giving yourself limits is working for only a concise period. ‘Five-minute-paintings’ are fantastic for this. I first learned about this concept from artist Jane Davies. And I have made many five-minute paintings since then. You set your timer, you put your materials out, and off you go. Time goes so quickly that you simply don’t have a chance to get stuck in your head. Your creative energy doesn’t get frustrated by the chattering mind. Of course, painting a five-minute painting can be difficult at first, because you might get stressed or stuck. But that is no problem since you only work for five minutes. After that, you can set your timer again. You can do only one five-minute painting, but also you can do four or so in a row, and stop within half an hour. If you practice this, you start to relax under time pressure. The chances are that you sometimes produce something that you like very much – even in such a short amount of time. And if not so, you have practiced your skills. You have made progress, in whatever way. If you challenge yourself to paint in unusual or imperfect places, you make yourself independent of the environment where you are. If you realize that you can make art at the airport, on holidays, in a café, on the floor or the kitchen table, you know that you can make art everywhere. Working on a minimal size can also free you up. When I was busy, I sometimes made a drawing on the back of a business card. I drew only in black and white, with a very thin black marker. It was so much fun to do, and it made me realize that I should not make such a big fuss about art-making. The essential thing is to create something that was not there before. And you can do that at any size. I hope I have inspired you to look with another eye at your lack of materials, time, and space. Maybe working within restraints can start to function as a way of unleashing your creativity. Let me know how your experiments turn out!